The minute I saw Thora Birch in Ghost World, I thought she looked familiar. Not because I remembered American Beauty, or because she resembles Jennifer Lawrence in The Hunger Games. I recognised her because I saw myself at that age – belligerently “different”, sneeringly aloof. Later on, I realised that she was nothing like me at all – just like in Mean Girls, there isn’t much difference between the cruelty of the alternative kids and the snooty jock set, except that here almost everyone is trying desperately to please her and she throws it all back in their faces. The trouble is that any time a film wears its indie-rock credentials on its lumberjack sleeve, we jump on it. Juno featured a Sonic Youth soundtrack and a smug, unlikeable cow in love with her own wit. Scott Pilgrim was a lousy, badly-edited adaptation of an amusing comic about a boy who treats women inexcuseably, but it’s OK because ZOMG video games! These films are about us, dammit! The Big Bang Theory coasted along with broad sitcom strokes just by haphazardly slapping Star Trek references onto a basic Friends formula, but ran out of ideas shortly after the second series. Maybe it’s not just enough to yell “THIS IS FOR YOU, NERD KIDS” every five minutes – there has to come a point where we stop celebrating sub-par entertainment just to feel included. Then again, I suppose it’s to be expected when there aren’t enough leading non-white roles on US television, or even a decent reflection of the 3 billion women in the world. Maybe for geek culture there needs to be something like the Bechdel test: say, two non-jock characters talk to each other where the joke isn’t about how weird they are. 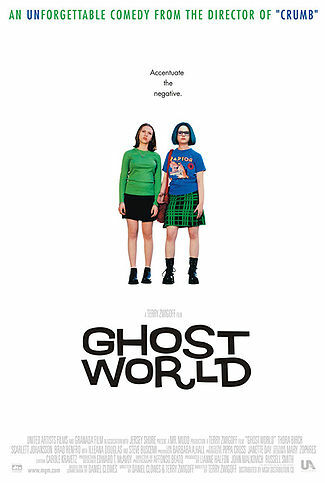 Ghost World was an entertaining film, but for something that was supposed to have been aimed at “people like me”, I recognised the boots … and that’s it.